With the trappings of Christmas neatly packed away, thoughts turn to a new year—one that promises new beginnings, new challenges, and new opportunities. Leo, the guy that takes care of the yard, recently went through a list of things that he planned to do while the weather was still cold. He would clean up any stray leaves; trim the hedge that was growing out of control; and cut back the wild honeysuckle bushes in the backyard. Then he would turn his attention to the liriope that borders the driveway. “We’ll cut that back by the first week of February,” he said—satisfied this would be early enough and long before any new growth appeared. We stood in the front yard a few moments longerlooking up at the gray sky. Both of us were thinking the same thing, “Maybe we’ll get some rain.” But neither one of us would say it. The drought had been severe and there was no talk of planting additional flowers in the spring. He climbed back into his truck, waved good bye, and drove off. As I turned to go back inside the house, I noticed movement along a tree limb above me. A pair of blue birds that normally began nesting in March was perched on a branch. “Two more months guys!” I reminded them. Then a closer look at the limb where they were sitting revealed something more. 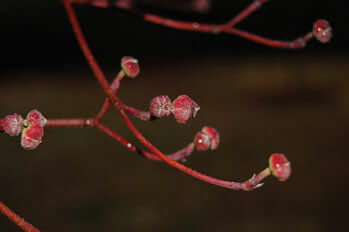 The buds on the dogwood tree had grown. The week before, they were barely visible, but now they were bold reminders that spring was on its way. I walked over to an area were daffodils had been planted years ago and raked back a section of pine straw. Sure enough, the first few tips of spring’s bright promise were pushing their way up through the loose dirt. Though winter’s gray hung heavy on the land, spring was unfolding all around me. Perhaps someone reading these words has endured the blustery winds of winter—the kind that threatens to strip away all hope, joy, and any sign of eager desire. You may have caught yourself wondering if the warmth of spring will ever return, or if God truly does give new beginnings. The answer is yes. In Revelation Jesus says, “Behold, I am making all things new” (vs. 21:5). This is His promise for the future, but even now, this promise is unfolding. Sin, heartache, disappointment, disease, or anything else cannot prevent spring’s return. Though there will be times when you winter and wait, you can be certain of one thing: God has a plan for your life—it is one of bright hope and promise. The past is behind you. But you have the future, and this is what counts the most to God.